Kate Moore's Radium Girls tells the story of the young female factory workers poisoned by radium in the 1920s and their inspiring pursuit of justice against great odds. 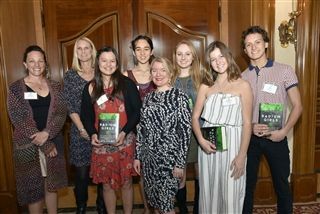 On February 14, a group of upper school students attended the Rancho Santa Fe Literary Society's Luncheon with the author. Having read the book, students from Mrs. Symington's AP Environmental Science class were able to ask in-depth questions to complement their studies on the chemical element. English students also attended the luncheon.